At the last European Championships, a young athlete from Turkey Esra Kiraz quite simply took two golds. It was clear that she was much stronger than all her rivals. 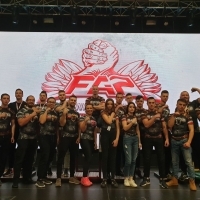 But this year Esra will miss the European Championship, which means that the champions' places become vacant and a serious fight will unfold for them. With a similar number of participants, the favorite to win is to consider the silver medal winner of 2016 for both hands – Marina Levchenko from Ukraine. But this year most likely in this category will take part another girl from Ukraine – Anastasia Goncharenko, who will also qualify for medals. Anastasia at the national championship showed an excellent shape and took first place on both hands, thus ahead of Marina Levchenko. Also in this category (in case of her participation) the current world champion Snezhana Babaeva would pull, and in this case she will be the main favorite. Category up to 55 kg among women is very competitive, looking at its composition it is difficult to predict who will be on top. Victoria Ilyushina is a legend of the Ukrainian armwrestling, she has been performing at international championships for a long time and takes high places every time. Wherever Victoria would perform, she would be one of the favorites. Another contender for the medal is Alina Volkova from Russia, who defeated Victoria at the World Championship 2016 on her left arm and became then the champion. We believe that the main contenders for gold on the left hand will be Victoria and Alina with about the same chances. On the right hand, Victoria and Alina will also be among the favorites, but Dimitrina Dimitrova from Bulgaria will likely become the champion. Dimitrina shows every time a good progress, which showed the World Championship in 2016, where she easily dealt with all her rivals. Ekaterina Nikisheva, Irina Gladkaya, Marlena Wawrzyniak – they shared prizes at the last European Championships. But last year Ekaterina and Irina talked about taking a break and quit pulling for a while. Of the last year's winners, only Marlena remains. But in 2016 at the European Championships Fia Reisek from Sweden, who at the World Cup 2016 took two silver medals, did not fight. In our opinion, Fia is the main contender for gold on both hands. In this category, everything is simple and understandable. Irina Makeeva can safely be called a sport legend. It's very likely that someone will be able to push her from the first place. Therefore, our forecast here is obvious – Irina Makeeva is the absolute champion in this category. In this category, the situation is approximately the same as the category of up to 80 kg. There is a clear favorite – Lithuanian Egle Vaitkute, who has dominated this weight for several years. However, not so long ago, Antonina Lissyanskaya from Kazakhstan showed us that you can fight with Egle and you can win it. But this is the European championship, not the world, so Egle will be the main favorite for gold.